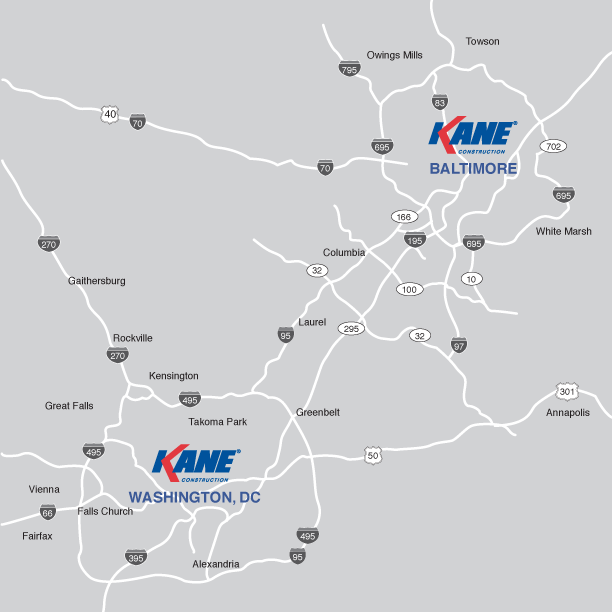 KANE Construction, Inc. (Gaithersburg, MD) proudly celebrates the 100-year anniversary of the KANE related entities providing best-in-class-services in the metropolitan Baltimore, MD and Washington, DC markets. 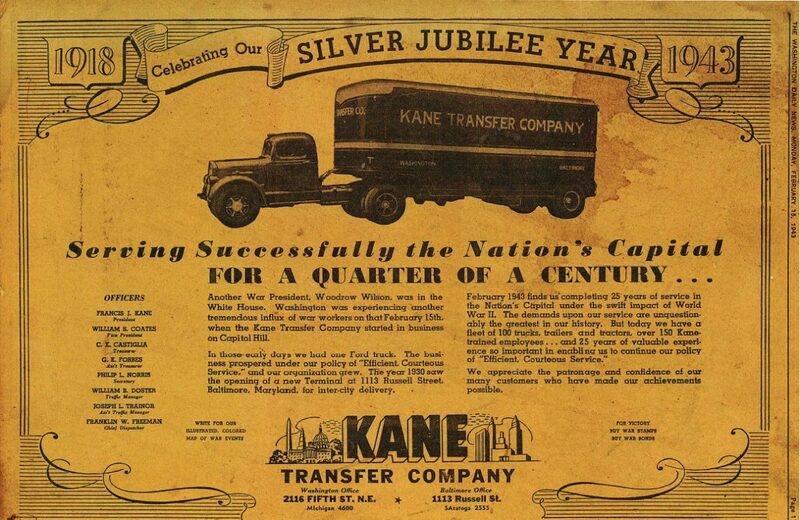 The Kane Transfer Company, was founded by Francis J. Kane on February 15, 1918. With a $500 bank loan used to buy a Ford Model T Truck, Francis operated the company initially out of a small garage on Ivy Street SE, just off New Jersey Avenue. The below image, taken from the Kane Family archives, is that of a silver jubilee advertisement placed by the Kane Transfer Co. in the Washington Daily News in 1943. The company would eventually operate 150 pieces of familiar green and gold equipment on the streets in the region. The elder Mr. Kane subsequently commenced the mentoring of his ambitious and organized nephew Eugene I. Kane (Dennis Kane’s father) upon his discharge from the United States Navy in 1953. Rising through the ranks in increasing responsibility to executive vice president by 1969, Eugene Kane was unable to reach terms of a generational business transaction. In effort to secure his financial future, and that of his family of nine children, the young Mr. Kane borrowed $5,000 from his mother with the rest financed by a loan from Mercantile Bank, to buy the assets of a Baltimore based local & short haul trucking company, which he would rename E.I. Kane, Inc. In patriotic fashion, he painted his vehicles red, white and blue. Ever the entrepreneur, Eugene Kane would go on to expand the E.I. Kane Companies into a variety of transportation related ventures. He ultimately became known for dominating the local trucking, office moving and limousine service industries. 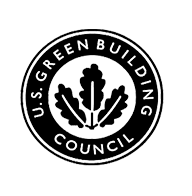 In the process, he garnered national recognition for his sensible business acumen and charitable endeavors.His firm would eventually operate a fleet of 300 vehicles with a payroll that often reached 1,500 leading up to its sale in 1999. Mr. Kane’s sons would go on to purse their own entrepreneurial ventures through various manners. When asked to comment, KANE Construction, Inc. CEO Dennis Kane stated, “Today, we pause to humbly reflect upon our past with great appreciation for the efforts of our fathers, founders and family alike. The significant personal risks taken and the passion for success put forth by those before us is unquestioned. Their ability to attract and retain the loyal team members requisite to execute on their vision is inspiring. Without a doubt, it paved the way for our own success to date – as a passion to succeed and a mindset to persevere knows no particular industry. Personally, I find it both an honor and a responsibility to carry forward in the same vein”.